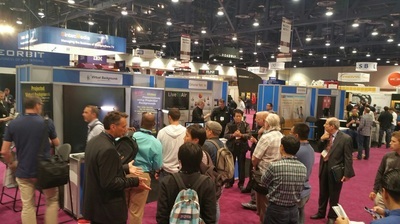 NAB is THE show in the world if one is in any kind of broadcasting and video production. 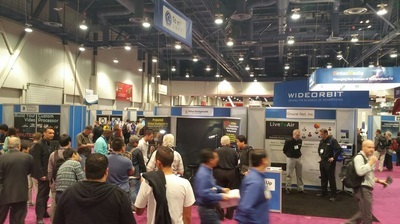 The NAB brings together over 80,000 visitors. 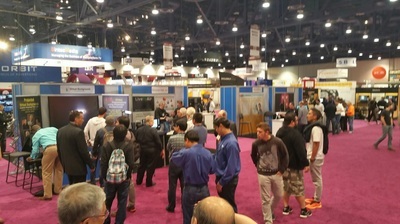 The show takes up all of the Las Vegas Convention Center and several nearby hotel showrooms. It is one of the Las Vegas's largest shows. Well it could have come out even 10 years ago but the product would have been far to large and too expensive to have been practical but with the recent technological developments in projector design, it is now possible to have a very economical projector that really works...and thus we have now introduced it to the video market as a clear alternative to traditional Chroma key (green screen). If the photographer or videographer has an assignment that really requires green screen, they can PROJECT the green on to the retro reflective screen and then end up with a product that is better than if they used a real green background. The new technology doesn't have some of the troublesome issues of regular green screen. Virtual Backgrounds even holds a US Patent on the process of projecting the Chroma key color instead of using a real green or blue background. Learn all about the Scene Machine projected background system in this 2 plus 1 event. Attendees can spend the first two days learning the technology along with hands on experience for just 195.00 including lunches and a wide variety of take home materials. For an additional 100.00, attendees can elect to stay for a third day of extensive supervised shooting experience with modesl provided by Virtual Backgrounds. WHAT DOES A SYSTEM COST FOR VIDEOGRAPHY? Most videographers find the system quite reasonable, especially when considering its time saving features. The projector sells for $4900.00 US. The special projection screen sells for under $70.00 per square foot which means that a small screen is very economical while large screens, up to 10 x 12 feet can be expensive. If the user values their time as well as the quality of the resulting images, the Scene Machine projected background system is an excellent value. The background color and brightness can be easily adjusted by using special filter sets available from Virtual Backgrounds. Simply insert desired color and neutral density filters in the projected beam. Virtual Backgrounds offers on site consulting at your facility. We can help you not only with using your virtual background system but we also provide help on marketing, lighting, posing, general studio operation, videography, Photoshop and Lightroom. It's not expensive and can be one of the best investments you ever made. Call (512) 524-7085 ext. 22. Click on the arrow to view. At the Government Video Show in DC, TV Technology saw our new projected background product and asked if they could do a review on it. The review was carried out by Chuck Gloman at DeSales University. It was published in the April 8 edition of TV Technology. Imagine, a new process that beats the pants off traditional green screen for many applications. It's here, now. The virtual projected backgrounds system has a completely new approach for video backgrounds that doesn't involve green screens or computers and comes with a wide array of advantages. It is the exact same digital system that is now available to portrait photographers for creating still backgrounds but now it can be used for creating still and moving video backgrounds for video production for TV, webinar production, internet videos, interviews and much more. The same system enables videographers to get into portrait photography and lets portrait photographers get into video production. The VB system offers many distinct advantages over traditional green screen such as no post production, no restriction on colors the subject wears, no green fringe around the subject, and the ability to place the subject up against the background instead of 6 to 10 feet in front of it and there is no green light in the studio contaminating the lighting. When the VB system was first shown at the Government Video Show in Washington DC, it won an award from TV Technology News for being one of the most innovative and affordable products at the show. 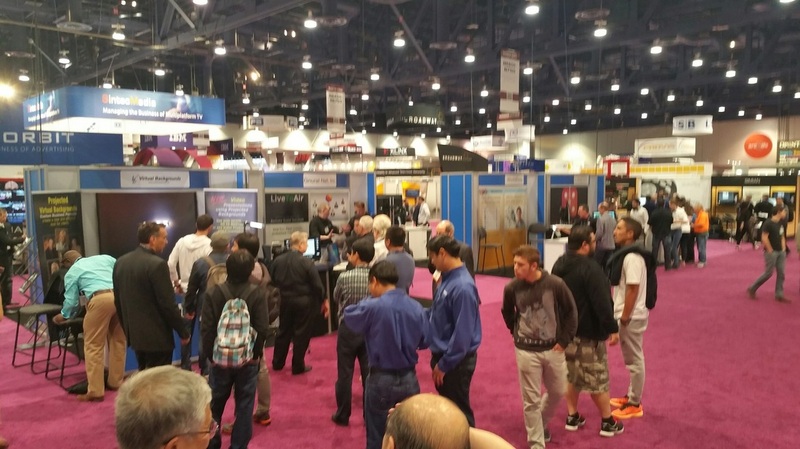 As a result, we exhibited it at the huge National Association of Broadcasters which brings together more than 80,000 people in Las Vegas. At NAB, many long time green screen users could not believe how simple and effective the new VB system is. At the Virtual backgrounds trade show booth demonstrations visitors often asked the subject to shake her hair looking for tell tale shadows. To further confuse visitors, the subject wore traditional green screen green and held in her lap some blue screen blue, neither of which caused a problem as happens with ordinary Chroma key. The most common comment from visitors was "cool...really cool!" and "I don't believe it!" but it is true. The VB projection system adds a whole new dimension to video backgrounds. Chroma key has been around for many years and has gradually seen improvements in the software for extracting and replacing backgrounds digitally but the process is hindered by a number of non fixable issues that are inherent in the Chroma key process. Simplicity is its most important advantage which also means saving the videographer a enormous amount of very tedious time...and time is money. The VB system uses projected digital backgrounds that reflect off a special retro reflective screen that is more than 1,000 times more reflective than white but only at the source of the illumination. The background is projected on both the subject and the background but the subject absorbs much of the light and what reflects is reflected in every direction. With the special retro reflective screen, the light that hits it is reflected directly back to the camera. Therefore, the key to the success of this process is differential reflectivity...the difference between the reflectivity of the background vs the reflectivity of the subject. One of the major drawbacks of typical green screen is the hours of tedious computer effort to knock out the green background, replace it with a background and then clean up the issues. Portrait photographers using green screen know this time consuming problem intimately, along with the other common issues that come with green screen. The new VB technology changes the world for both the portrait green screen users as well as for the videographers...and this the excitement. Today when many photographers take 20 to 50 shots of a subject and want a background in each proof, they can spend many hours plugging them in. With the VB system, the background is instantly captured just as if the subject were in front of the real background...because in essence they really are. What the photographer sees in the viewfinder is what they get...subject and background merged together. Videographers call it "in camera compositing." Of course it can be done but extracting a Chroma key background and replacing it with a selected background takes time struggling with the computer to clean up the image and it is not possible to show the customer instant results. With the VB technology, both the photographer and even the client can instantly see the background and the subject. It is instant in camera compositing making life so much more simple. Could be! If you are looking for a way to expand your photography career, video production is the natural direction to go in. Many who look toward to the future see video production becoming a much more important component of the photo industry as more and more companies, organizations, and businesses move to video to get their message across...coupled with many web/internet applications. You probably already own a video camera in your DSLR set to video mode. Virtual backgrounds give you the latest in backgrounds for your videos. You will need to learn basic video editing and you could get your video production business started. It is the future.